While leaving Paris Lagertha and Kalf are going back to Hedeby. Here we see a lot of betray. Kalf and Einar betray each other while Erlundur and Kalf make plans to kill Bjorn. Einar got castrated by Lagertha after almost killing every men in Hedeby because the people don't want the shared Earldom between Lagertha and Kalf. When Lagertha and Kalf talk about the future Kalf tells her he want children with her. Lagertha immediately thinks she can't have children because the seer told her so a long time ago. Lagertha got pregnant by Kalf and they marry but before they do Lagertha kills Kalf as she promised to him. Revenge for her because Kalf took her earldom away. 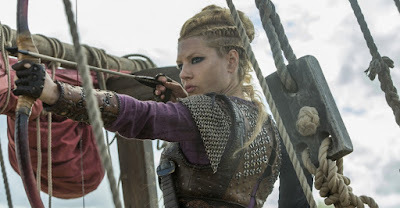 If she joins the raiding party to Paris we see a fully pregnant Lagertha. When Ragnar starts to get involved what Lagertha can and can't do she get mad at him because he is not her husband anymore. While working like the men she loses the child due to the hard work. While losing the child she told Ragnar she wanted to change the prophecy but couldn't after all. She seeks comfort with Ragnar and Bjorn. We see a vulnerable Lagertha in Paris when they meet Rollo it only gets worse she want to defend Ragnar but got stabbed trying to get to Ragnar. This stops the fight between brothers and left us wondering if Lagertha will make it to Kattegat or Hedeby.